Thanks chaps, I'm on a budget so have ordered the Draper jobbie. Hopefully brake maintenance should be less stressful from here on in. 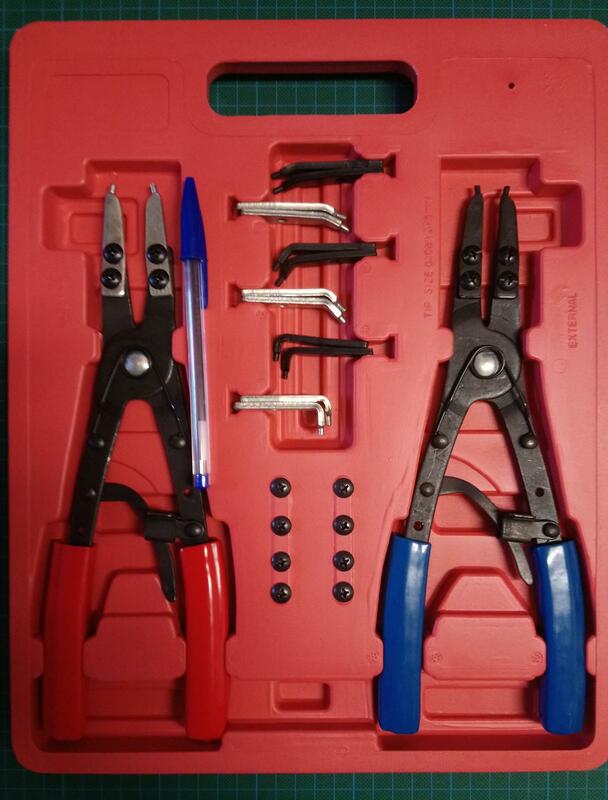 I ordered a set of ratcheting snap ring pliers off amazon for those pesky wheel bearing snap rings. Pen for scale. They are a bit rough around the edges, but for the price I paid (I think it was €20 with free delivery) I won't complain - as long as they don't explode on me. Plenty of leverage with the long handles. Edited by shoddybanger, 05 March 2019 - 12:43 PM. Talk to me about car creepers - as I don't have a nice flat garage floor just a knobbly tarmac road, is there any point in treating myself. or am I doomed to a life of sliding on the ground to get under cars ? Any recommends, dudes ? Halfords used to do a set of two polyurethane foam pads, a small one for kneeling and a large one for lying on; I never use the small one except as a cushion to land heavy things on but the bigun is used regularly as the drive is gravel and nothing rolls on wheels. I use a cheap Lidl one on my Tarmac drive. Works fine and can convert to a seat. Only got it fairly recently and its something I wish I got way sooner. My Mrs bought me one years ago which rolled really well on my block paved drive which wasn't ideal as it was steeply sloped. It did come in handy for rolling the engine out from under my VW camper. Now somewhat battered and bent with 1/3 of the wheels missing I still use it most weeks at work where the ground is hard(ish) and level(ish). It even survived being run over by a 4.5T Transit minibus with the bonus that it is now so knackered that if I moved back to the house with the sloping drive it might not make unscheduled descents at inopportune moments. Edit, I've just remembered why I used to hate it so much. I used to have long hair, the combination was not good as I would often run over my flowing locks resulting in painful gymnastics to kick the infernal device out from between me and my hair while under a car which is even more fun when you suddenly start heading off downhill. You may need a stupidly high-lift jack and super-tall axle stands to get under a car, given that depending on type of creeper, it will elevate you a certain height, which in turn raises one's paunch. I’ve got a set of those - They are pricey but bloody lovely - yet to use them in anger mind so not sure whether they’re really worth it if money is tight. For the best compromise, look out for a good used set on eBay, they come up from time to time. Their screwdrivers are awesome too! Another tentative shout for Wera. I needed a 1/4" drive socket set that wasn't mentally overpriced like Snap On is these days or had foul mentally oversized grips on the ratchet handles. Wera make a very sweet little 1/4" drive ratchet with a very slim handle - you know, because you tend to be using small stuff because access is limited - that comes in a really nice soft pouch instead of the usual Xmas cracker quality plastic box. Ratchet, couple of extensions, 5-13mm sockets and some other driver bits for about £60. Recommended. Really, don't bother. The number of times they are actually useful/helpful is somewhere close to zero. The rest of the time they just take up space. As recently discussed on the Bikeshite thread < here > and Blackboilersuit's recommendation, I'm looking to aluminium (HTS-2000) braze the cooling fins on one of my old bike engines. Accordingly I'm looking to buy a decent (high temp / map ) torch. Very soon I'll also have to face the plumbing on my boat (and I hate plumbing !) so I'll need a torch for soldering pipe connections too. It's always useful to have a localised flame for undoing seized bolts, to seal ends of polypropylene rope, to light the fire, etc ..and I've also wondered about gas soldering electrical connections ..where getting electric extension leads etc out is just such a pita. 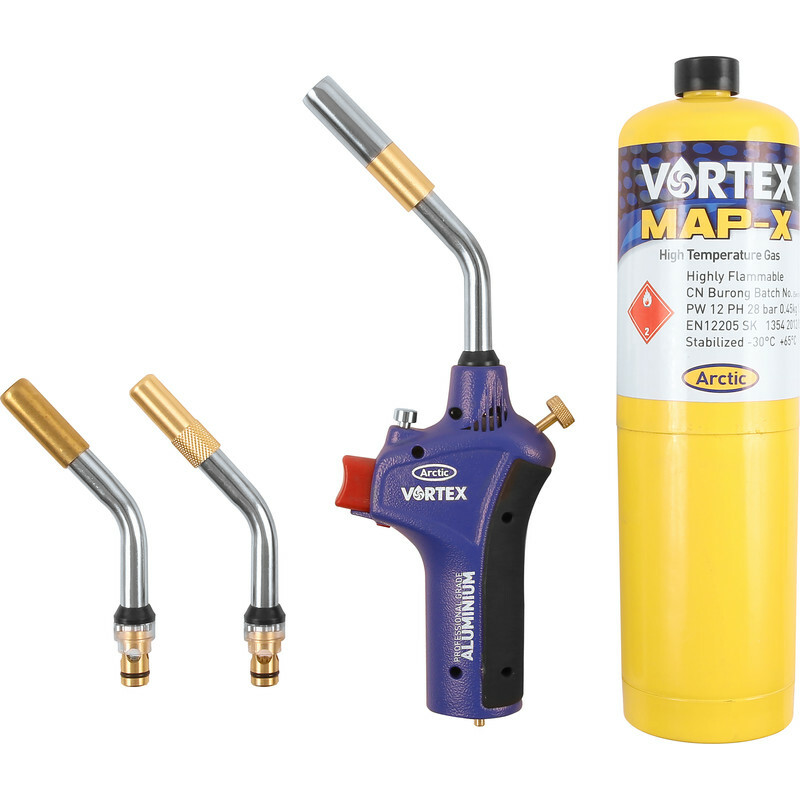 So I was thinking of getting the Vortex map torch package with its three interchangeable heads / nozzle sizes. Tool-station is not on my list of favourite stores - but they do seem to offer the best price (£61) for the torch < here > and for the map gas (£11.32). However the torch is out of stock ..and perhaps will be more expensive as n' when new stock comes in. So two questions - 1. Are these torches any good ? and 2. aside from ebay can anyone suggest a least expensive (with p&p) place to buy from ? EDIT : Ok I've just found it at CPC for just under £60 and their gas is (£9.59) so that's cheaper too, and they have free delivery on orders over £8. It seems a lot of money for a blow torch but if it'll last and be reliable then I'm prepared to pay that for a useful tool. But is it any good ? (I have read criticism that teh interchangeable nozzle fitting is a bit iffy). Someone suggested a company called CJ Auto's re. car lifts for the home garage. I was also told their stuff is well engineered, so I looked at their website and was impressed with their 3-in-1 Tilting car lift. < here > NB. I'd use acro type rests under each end to prevent unwanted rocking as I fought with stubborn fastenings. And as it's on wheels then I'm told the car can be moved around for more working space around one side. Car lift and mobile cradle in one - neat. And most likely it could be used to simply tilt the car on one side. It would seem to be handy for lifting under the car and even along a Citroen punt chassis, or other marque's backbone chassis, rather than under crusty cills (..in British English should that be sill ?). True with VAT it's close to £500 but in the big / long term picture, and seeing how it might ease and also quicken so many tasks of restoration and maintenance - it seems a reasonable price if well engineered. Has anyone here used one ? 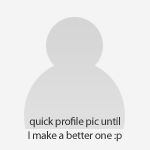 ..and can give feedback.